I have always loved vegetables of every size, shape and description, but I have never really used kale very often in my cooking until recently. Being French Canadian by birth, I do not think kale ever made it into our refrigerator while I was growing up, and at that time I’m sure I wouldn’t have known kale from a potato if you had asked me to describe it. After we moved to Italy, although we ate many varieties of greens, kale as we know it here in the US just wasn’t readily available. Italians enjoy types of greens, but broccoli rabe, bietola, rapini, and the typical head of cabbage seem to be more popular than kale. In Italy, the only true kale variety I’ve found is called Tuscan black cabbage, (cavolo nero), also known here as Tuscan Kale, Laciniato or dinosaur kale. In reality, kale is indeed a form of cabbage, belonging to the Brassica family (along with broccoli and brussel sprouts), but kale in comparison to cabbage, does not form a head. These days in North America it seems everywhere you turn you see kale, and it has become so popular that even our local grocery stores offer multiple varieties. Other popular varieties of kale include the curled Scotch Vates, and the purple veined Red Russian, both varieties I’ve recently found and purchased at my local green grocer. Kale has thick, ruffled, usually dark green leaves that have an earthy cabbage flavor. Considered a “non-heading” cabbage, kale is generally grown through the fall and winter as it is one of the few vegetables that can withstand frost. Along with it’s other members of the Brassica family, this low calorie green provides an excellent source of vitamins A, C, Carotenoids, along with a decent amount of fiber, iron, and calcium. The amount of vitamin K, important for blood clotting, in kale is far superior to that found in broccoli, spinach, and Swiss chard. I have recently become quite enamored with kale lately as I have a wide selection of organic varieties available locally. 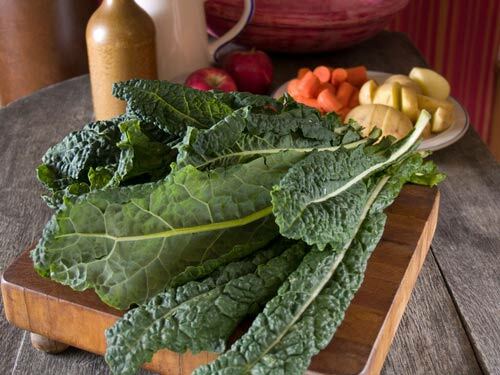 Kale is actually a very versatile vegetable that when very fresh can be eaten raw in salads, cooked as a side dish, added to soups or stews, and can even be easily made into Kale Chips, which are highly addictive crisp bites of deliciousness. I have been buying a couple of bunches of kale every week and have thoroughly enjoyed adding them to many of our meals. Although I do like most greens, the rich, earthy flavor of kale for me somehow now makes spinach taste pretty insipid. I do urge you to try replacing kale in place of other greens in your recipes, and I am sure you’ll enjoy the flavor and your body will also thank you! How To Buy: Look for deeply colored, crisp leaves free of blemishes. Avoid any that show signs of wilting, yellowing, or bruising. If at all possible, choose smaller bunches with thinner stalks which will be more tender. How To Store: Kale keeps very well for a few days when stored loosely in plastic bags in the refrigerator. If the leaves are wet when you bring them home from the market, simply blot them with paper towels before storing to prevent early spoilage. How To Prepare: The tough center vein and stalks should be removed and discarded. Wash the leaves well before using. To easily chop, stack the leaves in a pile, roll them, and then use a sharp knife to cut crosswise into thin ribbons. Kale can be boiled first, then braised or sauteed.